Not to be confused with Seget. Szeged (Hungarian pronunciation: [ˈsɛɡɛd] ( listen); see also other alternative names) is the third largest city of Hungary, the largest city and regional centre of the Southern Great Plain and the county seat of Csongrád county. The University of Szeged is one of the most distinguished universities in Hungary. The famous Szeged Open Air (Theatre) Festival (first held in 1931) is one of the main attractions, held every summer and celebrated as the Day of the City on May 21. The name Szeged might come from an old Hungarian word for corner (szeg), pointing to the turn of the river Tisza that flows through the city. Others say it derives from the Hungarian word sziget which means 'island'. 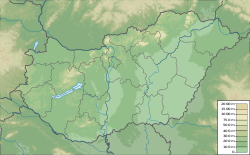 Others still contend that szeg means 'dark blond' (sötétszőkés) – a reference to the color of the water where the rivers Tisza and Maros merge. 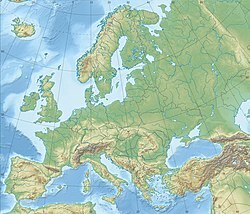 The city has its own name in a number of foreign languages, usually by adding a suffix -in to the Hungarian name: Croatian, Segedin; Romanian, Seghedin; Bulgarian, Belarusian, Russian and Ukrainian, Сегед (Seged); German, Szegedin / Segedin; Italian, Seghedino; Latin, Partiscum; Latvian, Segeda; Lithuanian, Segedas; Polish, Segedyn; Serbian, Segedin, Сегедин; Slovak and Czech Segedín; Turkish, Segedin. Szeged and its area have been inhabited since ancient times. Ptolemy mentions the oldest known name of the city: Partiscum. It is possible that Attila, king of the Huns had his seat somewhere in this area. The name Szeged was first mentioned in 1183, in a document of King Béla III. In the second century AD there was a Roman trading post established on an island in the Tisza, and the foundations of the Szeged castle suggest that the structure may have been built over an even earlier fort. Today only one corner of the castle still remains standing. During the Mongol invasion the town was destroyed and its inhabitants fled to the nearby swamps, but they soon returned and rebuilt their town. In the 14th century, during the reign of Louis the Great, Szeged became the most important town of Southern Hungary, and – as the Turkish armies got closer to Hungary – the strategic importance of Szeged grew. King Sigismund of Luxembourg had a wall built around the town. Szeged was raised to free royal town status in 1498. Szeged was first pillaged by the Turkish army on 28 September 1526, but was occupied only in 1543, and became an administrative centre of the Ottomans (see Ottoman Hungary). The town was a sanjak centre first in Budin Eyaleti (1543–1596), after in Eğri Eyaleti. The town was freed from Turkish rule on 23 October 1686, and regained the free royal town status in 1715. In 1719, Szeged received its coat of arms (still used today) from Charles III. During the next several years, Szeged grew and prospered. Piarist monks arrived in Szeged in 1719 and opened a new grammar school in 1721. Szeged also held scientific lectures and theatrical plays. These years brought not only prosperity but also enlightenment. Between 1728 and 1744 witch trials were frequent in the town, with the Szeged witch trials of 1728-29 perhaps being the largest. The witch trials were instigated by the authorities, who decided on this measure to remove the problem of the public complaints about the drought and its consequences of famine and epidemics by laying the responsibility on people among them, which had fraternized with the Devil. In 1720, the ethnic Hungarian population of the town numbered about 13000 to 16000, while the number of the Serb inhabitants was 1300. Szeged is known as the home of paprika, a spice made from dried, powdered capsicum fruits. Paprika arrived in Hungary in the second half of the 16th century as an ornamental plant. About 100 years later the plant was cultivated as an herb, and paprika as we know it. Szeged is also famous for their szekelygulyas, a goulash made with pork, sauerkraut and sour cream. And also famous for their halászlé, fish soup made of carp and catfish. The citizens of Szeged played an important part in the Hungarian Revolution of 1848. Lajos Kossuth delivered his famous speech here. Szeged was the last seat of the revolutionary government in July 1849. The Habsburg rulers punished the leaders of the town, but later Szeged began to prosper again, the railway reached it in 1854, and the town got its free royal town status back in 1860. Mark Pick's shop – the predecessor of today's world-famous Pick Salami Factory – was opened in 1869. Today the inner city of Szeged has beautiful buildings and wide avenues. This is mainly due to the great flood of 1879, which literally wiped away the whole town (only 265 of the 5723 houses remained and 165 people died). Emperor Franz Joseph visited the town and promised that "Szeged will be more beautiful than it used to be". He kept his promise. During the next years a new, modern city emerged from the ruins, with palaces and wide streets. After the First World War Hungary lost its southern territories to Serbia, as a result Szeged became a city close to the border, and its importance lessened, but as it took over roles that formerly belonged to the now lost cities, it slowly recovered. 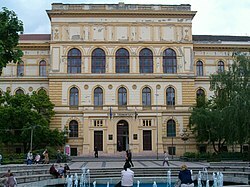 Following the Loss of Transylvania to Romania, University of Kolozsvár (now Cluj-Napoca, moved to Szeged in 1921 (see University of Szeged). In 1923 Szeged took over the role of episcopal seat from Temesvár (now Timișoara, Romania). It was briefly occupied by Romanian army during Hungarian-Romanian War in 1919. 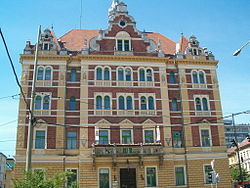 During the 1920s the Jewish population of Szeged grew and reached its zenith. 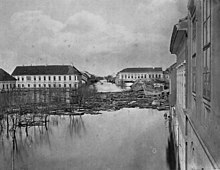 Szeged suffered heavily during World War II. 6,000 inhabitants of the city were killed, the Jewish citizens were confined to ghettos and then taken to death camps. Szeged was captured by Soviet troops of the 2nd Ukrainian Front on 11 October 1944 in the course of the Battle of Debrecen. During the Communist-era, Szeged became a centre of light industry and food industry. In 1965 oil was found near the city; the area now satisfies 67% of the country's oil demand. In 1962, Szeged became the county seat of Csongrád. Whole new districts were built, and lots of nearby villages (e.g. Tápé, Szőreg, Kiskundorozsma, Szentmihálytelek, Gyálarét) were annexed to the city in 1973 (as was a tendency during the Communist era). Today's Szeged is an important university town and a popular tourist attraction. The Szeged Symphony Orchestra (Szegedi Szimfonikus Zenekar) gives regular concerts at the Szegedi Nemzeti Színház. Szeged is situated near the southern border of Hungary, just to the south of the mouth of the Maros River, on both banks of the Tisza River, nearly in the centre of the Carpathian Basin. The Hungarian frontier with Serbia is just outside the town. Szeged's climate is transitional between oceanic Köppen "Cfb" (Marine West Coast Climate/Oceanic climate) and continental (Köppen Dfb), with cold winters, hot summers, and fairly low precipitation. Due to the high hours of sunlight reported annually, Szeged is often called City of Sunshine (Napfény városa). The city of Szeged has 62 kindergartens, 32 elementary schools and 18 high schools. The two most prominent high schools (Ságvári Endre Gyakorló Gimnázium and Radnóti Miklós Kísérleti Gimnázium) are in the top fifteen in the country. Szeged is the higher education centre of the Southern Great Plain and has built quite a reputation for itself. Thousands of students study here, many of whom are foreigners. The University of Szeged is according to the number of students the second largest and the 4th oldest university of Hungary being established in 1581. Ranked as the top university of the country on Academic Ranking of World Universities - 2005, and in the top 100 in Europe, it offers several programs on different fields of study. The Biological Research Centre of the Hungarian Academy of Sciences, which was built with the help of UNESCO funds, has also been a considerable source of advanced research. Scientists at this laboratory were first in the world to produce artificial heredity material in the year 2000. The building has served as a home to many well known conferences and continues to make contributions to the world of science. The Szent-Györgyi Albert Agóra is a cultural scientific centre of Szeged which gives home to laboratories of the Biological Research Centre and to exhibitions of the John von Neumann Computer Society especially their IT historical exposition. In 2018 the new scientific institution, the ELI Attosecond Light Pulse Source (ELI-ALPS) opened in Szeged establishing a unique facility which provides light sources within an extremely broad frequency range in the form of ultrashort pulses with high repetition rate which is needed for different kinds of physical experiments especially in the field of attosecond physics. 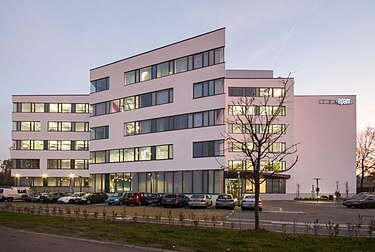 The new office building of the EPAM Systems, completed and opened in 2017 September. Szeged is one of the centres of food industry in Hungary, especially known for its paprika and companies like Pick Szeged, Sole-Mizo, Bonafarm etc. 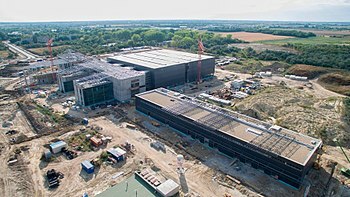 Other notable companies having their headquarters in Szeged are AMSY International, RRE - Szeged, Optiwella, Generál Printing House, RotaPack, Sanex Pro, Agroplanta, Karotin, Florin, Quadrotex and SZEPLAST. Others, like ContiTech, Duna-Dráva Cement, Szatmári Malom and Europe Match, are not based in the city, but have production facilities there. The Hangár Expo and Conference Centre provides space for international exhibitions and conferences. The most popular sport in the city is handball. The city has one well-known club the 2013-14 EHF Cup-winner SC Pick Szeged playing in the Nemzeti Bajnokság I. The second most popular sport is football in the city. Szeged had several clubs playing in the top level Hungarian league, the Nemzeti Bajnokság I. These are Szegedi AK, Szegedi Honvéd SE. The only currently operating club, Szeged 2011 play in the Nemzeti Bajnokság II. The city offers a wide range of media – television and radio stations, and print and online newspapers. See also: Category:People from Szeged. Elisabeth (Sisi) was Empress of Austria and Queen of Hungary. The Great Flood (1879) Statue. View from Votive Church Dome. Szeged is the most important transportation hub in the Southern Great Plain. Two motorways, M5 and M43, lie along the city border. Through the M5 Motorway Szeged is connected to Kecskemét, Kiskunfélegyháza and Budapest in the north direction and to Subotica, Novi Sad and Beograd in Serbia in the south direction. Thanks to the M43 Motorway - which splits from the M5 Motorway near Szeged - goes near Makó to Arad and Timisoara in Romania. In addition, there are other roads running from the city to Makó and Nagylak (Mainroad 43), to Röszke (Mainroad 5), to Kiskunfélegyháza (Mainroad 5), to Ásotthalom and Baja (Mainroad 55) and to Hódmezővásárhely, Orosháza and Békéscsaba (Mainroad 47). The Budapest-Szeged-rail line is also affected, as well as the Railwaylines 121 (to Makó), 135 (to Hódmezővásárhely), 136 (to Röszke) and 140 (to Kiskunfélegyháza). The city is also a common stop for national and international long-distance buses. Szeged Airport is the international airport of Szeged. As of May 2018 Szeged had 39 local bus lines - 15 in the city centre and 24 in the suburbs. While there were also 5 tram lines. ^ Szeged Symphony Orchestra website, accessed 6 August 2012. ^ "Monthly Averages for Szeged 1971-2000". met.hu. ^ "Städtepartnerschaften und Internationales". Büro für Städtepartnerschaften und internationale Beziehungen (in German). Retrieved 26 July 2013. ^ "Miasta partnerskie - Urząd Miasta Łodzi [via WaybackMachine.com]". City of Łódź (in Polish). Archived from the original on 24 June 2013. Retrieved 21 July 2013. Wikimedia Commons has media related to Szeged. Wikivoyage has a travel guide for Szeged.